Stnkrbug: How to Achieve Your 2017 Goals! 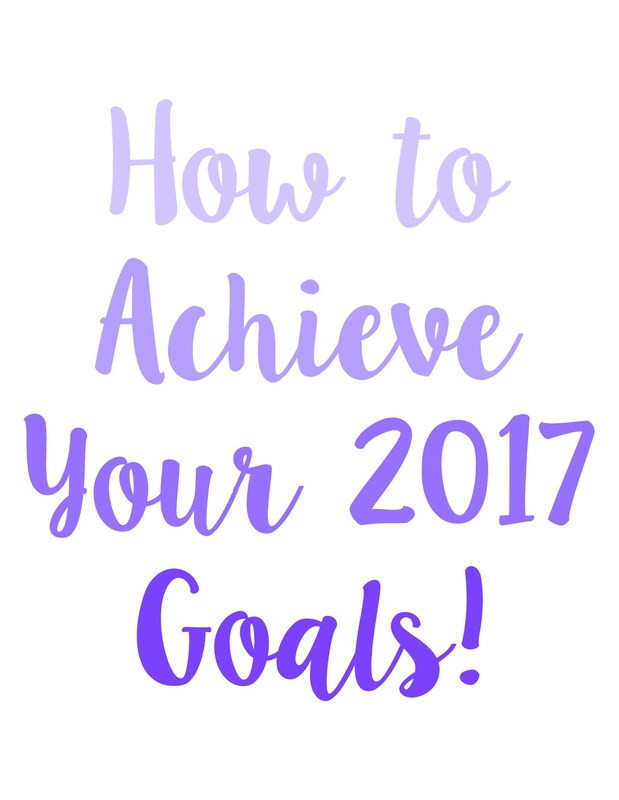 How to Achieve Your 2017 Goals! With all New Years come goals and resolutions that we try our hardest to achieve, but might forget about them after about a month. I'm so guilty of this, as I've tried to set goals for myself in the past, and easily forgotten about them once I start getting busy with the new year. Last year I felt like I did a pretty good job about actually achieve my goals and holding myself accountable to them, so I thought I would share some tips with you on how to do the same! I'm no life expert - no one is except maybe Oprah - so of course take these tips and apply them how they would best fit your life. No one is the same so different things work for different people! These are just some things that really seemed to work for me. Also, if you would like, here is the video I made about this same thing on my channel! This may seem obvious, but writing down your goals in a place that you'll see them often (i.e. a planner, or journal you use a lot) will keep reminding you of them. Constant exposure to them will also inspire you to actually achieve them, since it's so satisfying to check them off! I don't know about you, but that is seriously one of the best feelings for me. Whenever I make a to-do list, I live for getting all of the tasks done so I can check them all off. The same feeling definitely applies to bigger goals for the year, especially because you'll feel even more satisfied once you achieve something greater than getting done a chore list you made for yourself. I usually try and write down my goals in my general goal journal, just on a page of their own that is highlighted and definitely distinct from the other pages. This helps me so much because I'm constantly reminded of them, and there's no way that I could forget them! Once you have figured out and written down your goals, visualize yourself achieving them. Visualization is something that has been proven to work, because you feel that much more comfortable and confident in doing something or getting it done. I started doing this when I swam and danced, and it helped me immensely. I knew I could do the action because I had imagined myself succeeding it over and over - when the time came to do it in real life, I knew I could get it done! The same really goes for goals, especially larger ones. If you think about yourself having gotten all of these goals done at the end of the year, you'll be really motivated to make that possibility a reality. If you have a goal that has to do with changing something about yourself, like being more outgoing, visualize yourself talking to more people in situations that usually make you uncomfortable. When the time comes to actually do it, you'll feel a lot better a out the whole situation, and achieving that goal will be that much easier. 3. Start with small goals. It can be really easy to want to set huge goals right at the beginning of the new year if you are really hoping for a change, but be careful not to get too ahead of yourself. I'm not saying to limit yourself - if you want to set those goals then go for it! But if you know they'll end up being too big for you to achieve all at once, start smaller in the beginning of the year and work your way up throughout the rest of the year. If you're wanting to get in better shape, don't start by making a goal to workout every single day for an hour if you haven't been doing so. Start by motivating yourself to workout one more day a week, or maybe 15 minutes longer a day. Starting with these smaller goals will help you build on them throughout the year, and you also won't get disappointed when you can't get these unrealistic goals done, or are really struggling with them. This isn't an excuse to not push yourself, though; on the contrary, this will help you actually achieve more because the small goals will snowball on themselves, and by the end of the year, you'll realize just how much you've gotten done! This is something that is super important for goals. I remember in elementary schools my teachers would have the class set individual goals, write them down on paper, and a couple of months later we would have to read the goals again and see how we were doing. At the time we all thought it was extremely pointless, but looking back, I realized that this just motivated us further to get these goals done. Had we not been shown them again, we probably wouldn't have been so inspired to get them done, or make a change. Checking in with your 2017 goals about halfway through the year in June will help you see how they're going, if you need to adjust goals, if you need to work harder, or just simply remind you of what they were in the first place. A halfway point check in is great timing, because you still have six months to achieve your goals. Keeping yourself accountable is really similar to checking in with yourself, but it also has to do with keeping yourself motivated throughout the year. Don't let yourself slack off if a goal is hard, instead try your hardest to get it done. That can be easy to say, but your mind is a really powerful thing. Keep thinking of the end result, and the effort you're putting in won't seem as difficult. It can be so easy to forget about a goal or give up, but you'll be so much happier in the end if you stick it out. Alright, well there are five tips on how to achieve your 2017 goals! I'm so excited to see what this new year has to offer, and let's hope that it's a lot better than 2016! 6 Ways to Stay Out of the January Slump!